Mary accepted her election as Mother of the Son of God, guided by spousal love, the love which totally “consecrates” a human being to God. By virtue of this love, Mary wished to be always and in all things “given to God,” living in virginity. The words “Behold, I am the handmaid of the Lord” express the fact that from the outset she accepted and understood her own motherhood as a total gift of self, a gift of her person to the service of the saving plans of the Most High. And to the very end she lived her entire maternal sharing in the life of Jesus Christ, her Son, in a way that matched her vocation to virginity (The Mother of the Redeemer, no. 39). That Mary remained a virgin her entire life is thus a De Fide doctrine of the Catholic Church (see, for example, Documents of Vatican II, LG57, Catechism of the Catholic Church, 499, and Ludwig Ott’s Fundamentals of Catholic Dogma, pages 203-206). But is this doctrine of Mary’s perpetual virginity contained in Scriptue? An analysis of Luke 1:34 demonstrates that Mary had made a vow of virginity to God. Confronted by this [the angel Gabriel’s] wondrous announcement, however, the virgin finds herself embarrassed; not because of the sublime greatness of the majesty announced to her, but rather for the way in which such a maternity might be realized. The embarrassment would seem inexplicable because, on any reasonable grounds, she is precisely a woman in ideal conditions to conceive a son. She is the young spouse of Joseph – What young spouse would not be inclined to desire a beautiful son? It is obvious, therefore, and must be acknowledged that Mary’s difficulty stems from a precise commitment — vow or promise — “not to know man,” that is, to be and remain a virgin. St. Augustine rightly says, that ‘Mary certainly would not have spoken those words If she had not vowed her virginity to God.” In fact, only by admitting Mary’s virginal consecration to God, can it be understood why she found herself facing an unsolvable dilemma: How to reconcile her virginal offering to God with the request of maternity on the part of God? How could she become a mother without betraying a promise of virginal consecration to God (Stefano Manelli, All Generations Shall Call Me Blessed, pages 137-140). CONCLUSION: Mary consecrated her life to God through a vow of virginity. Mary’s words to the angel in Luke 1:34 would hardly make sense unless she had made a vow of virginity. Image: A statue of the Virgin Mary in France. 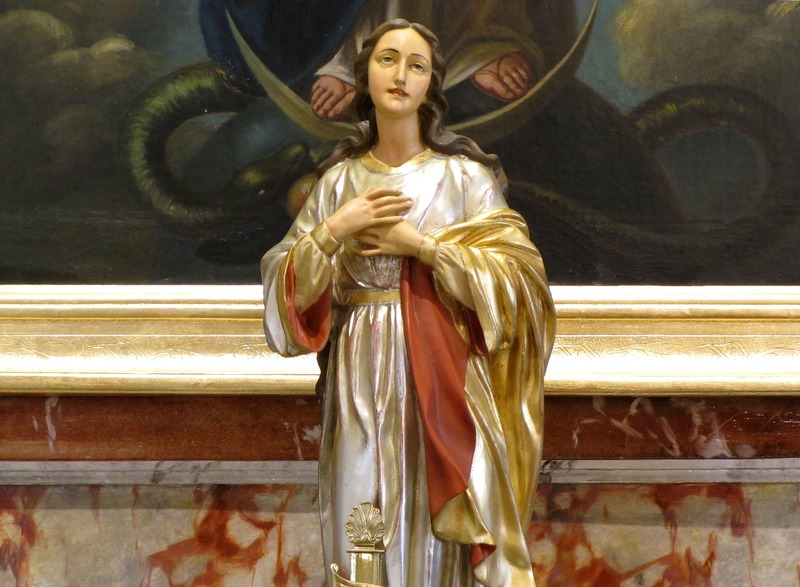 Behind the statue is a picture of her crushing the head of Satan, showing the power of her consecrated life over evil.